Let’s look at each of them. Click on the titles to read the full stories and to see even more pictures. 1. A library/clinic in Indonesia. This multi-color complex houses both a library and a free clinic. The different colors are for different purposes – blue for entertainment and popular books, red for science and technology (as well as being a canopy for the covered reading area), yellow for women’s books and green as the lobby. There is a container used as an entry ramp. 2. 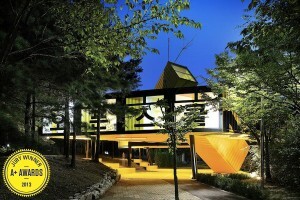 A park center in Seoul, Korea. 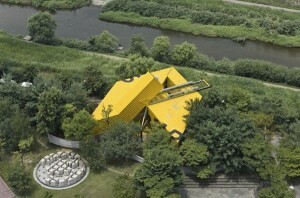 In Hakwoon Park in the Seoul suburb of Anyang, eight containers were converted from container to the Architecture + Fabrication award for the Anyang Public Art Project by LOT-EK Studio. The containers are raised up creating an “Open School”. Exhibits and discussions are hosted in the space to encourage people to think about more active foot-traffic and how that can change communities. Again, a container is used to create a ramp to bring people up into the space and ends are cut out of the containers to make it feel like a treehouse. Containers are also cut to create triangles. 3. Low-cost housing in Salt Lake City, UT. Jeff White, a real estate broker and Crossroads Urban Center (a low-income advocacy group) volunteer, saw that there was a need for low-income housing for single adults. He also got interesting in the “tiny home” movement. Bringing the need and tiny-home trend together, he used a 40’ high cube container to build a home on his property. The city noticed he was making it, but after explaining the project to the city inspector, he was able to work with the city to make sure the home was compliant and that they approved of it. The first home is nearly done and they are hoping to sell it. The first home was more expensive, they are hoping experience will bring that price down. Container uses are limitless. Have you been thinking through a solution that involves a container? If so, tell us about it!